For more than 150 years, education has been organized around classrooms in which one teacher attempts to meet the needs of a large group of students who have a wide range of prior experiences, knowledge, and ways of learning. This structure makes it exceedingly difficult to ensure that all students meet the same standards of performance. School of One (SO1) is an innovative, technology-enhanced math program that seeks to "meet students where they are," by creating individual learning plans, offering multiple teaching strategies, and using daily assessments to monitor progress and adapt lessons as needed. 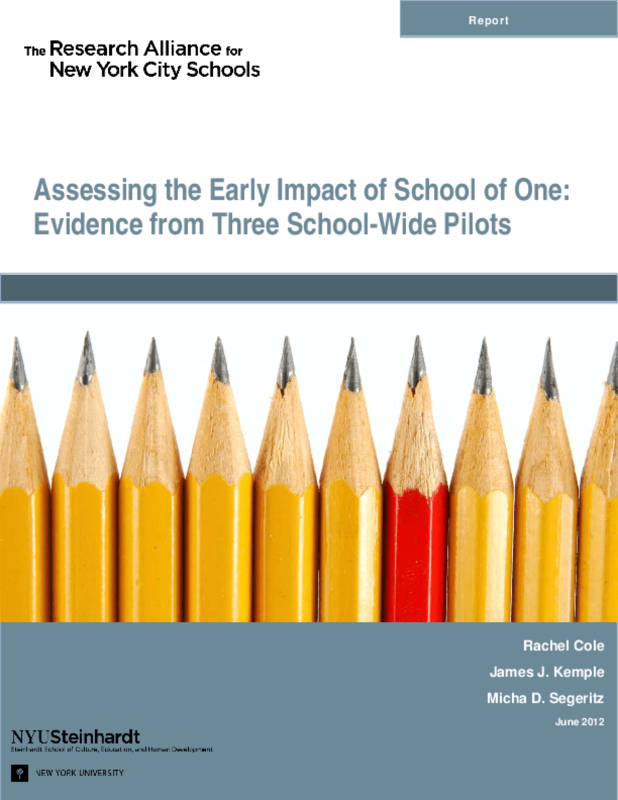 This report evaluates SO1's impact on students' state test scores during the first year of school-wide implementation in three New York City middle schools. It also presents exploratory analysis examining whether exposure to more SO1 material, or mastery of SO1 skills, is associated with improved math performance. Given the early stage of the program's development, the authors caution that the evaluation should not be interpreted as a definitive assessment of SO1's effectiveness. Rather, the findings provide a preliminary assessment of SO1's initial impact on students' math achievement and offer insights that may contribute to the program's development and inform future research. Copyright 2012 by The Research Alliance for New York City Schools. All rights reserved.